Today was an experimental baking day. I ran out of eggs the other day and my oldest is always very hungry when he gets home from school. Knowing that I had to think of something fast I made vegan oatmeal cookies. I knew that they were good when my youngest tried to eat the batter before it went into the oven. Needless to say the cookies have all been eaten and I think that I may have convinced my husband that vegan cooking can be delicious when done properly. Of course after all of the cookies were eaten none of my family was hungry for dinner. I decided that since the cookies were almost all oatmeal and brown rice flour, it was pretty close to a healthy breakfast food and I didn't argue too much. Making healthier baked goods has been one of my goals for the last month. I have also been trying to incorporate more chicken into my family's diet. My husband prefers pork, so I have been trying to find chicken recipes with a lot of flavor in order to trick my husband into eating them. This week I tried a new recipe for Stewed Chicken and Chickpeas from the January/February 2013 issue of the Food Network Magazine. This recipe has 12 ingredients. It takes a total of 35 minutes, 15 minutes of which is active and makes 4 servings. I did make a few modifications to this recipe. First I was unable to find 6 ounce breasts. The meat selection at our grocery store is always limited so I had to use slightly larger chicken breasts. I do think that the recipe would work better with the smaller breasts if you can find them. For the red pepper flakes I used a full teaspoon and I used 1/2 teaspoon of garam masala. I chose to leave off the fresh parsley since my local grocery store refuses to stock flat leaf and I just can't get a taste for curly parsley, the texture gets to me. Since I eat gluten free I left out the pita and served the dish over quinoa which I had cooked with butter and minced garlic. I followed the remainder of the recipe as written. 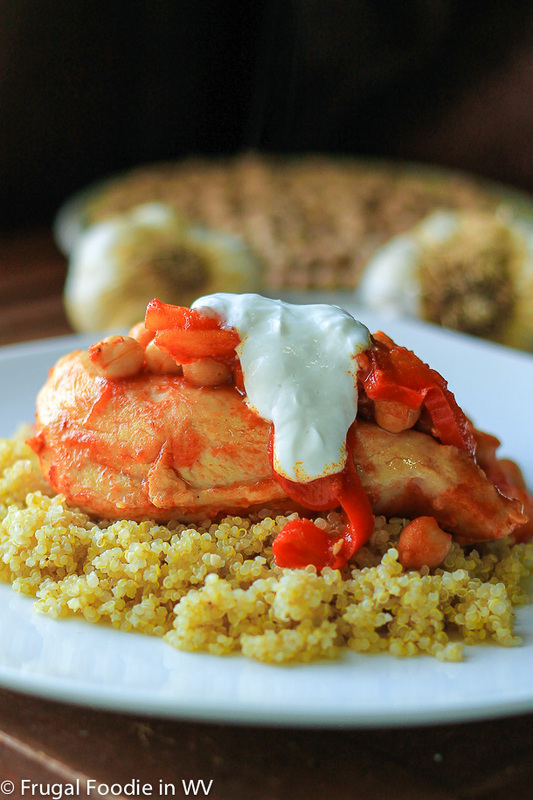 The red pepper and chickpeas are the star of this dish. The chicken cooked well and was tender, especially given that my family prefers chicken thighs. However, the best part of the dish was definitely the sauce. I thickened the sauce at the end with a small amount of cornstarch and it was great over the quinoa. Additionally, it re-heated very well the next day. For the recipe go to Stewed Chicken and Chickpeas. Thanks, it really was delicious!